Are you looking for inexpensive decor to liven up your home? Look no further! Today we have a project idea that was inspired by twig art used to decorate living room walls. 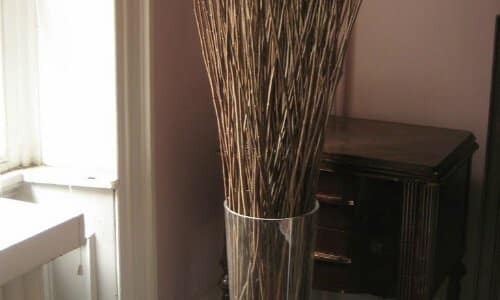 If twig art is a little too bold for your taste, you can try making a twig arrangement for a more subtle alternative. Twig arrangements are elegant in their simplicity and will lend your living room some rustic charm. The next time you go on a hike or nature walk, bring along a basket and collect some twigs to get started! Add your twigs to the Mason jar or vase one at a time. You can also make several arrangements by placing them in matching drinking glasses. Use the garden shears to trim them at varying lengths or at a uniform length as desired. Bundle the twigs together using a rubber band. If you’re using a Mason jar or drinking glasses, place the rubber band at the same level as the mouth of the jar or glass. Tie a length of ribbon into a bow around the mouth of the jar or glass. If you’re using a vase, tie a bow around the neck. Optional: For some added flair, take some fabric flowers and wrap their stems around the twigs to hold them in place.